The leak is from the front of the engine. This is a GM family 2.2L DOHC engine with the crankshaft pulley driving a timing belt, the two cams and the water pump. Driving the car up on ramps and removing a plastic cover, which covers the underside of the front of the engine and the right wheel well, and running the car, revealed a steady stream of oil coming from under the timing cover at the crankshaft sprocket. The front of the engine will have to be torn down to complete this seal replacement. The oil contaminated timing belt will also need to be replaced. It is not too difficult to tear this engine down to get to the belt and seal. Tools: A hydraulic or scissors jack, jack stands or substantial wood supports, a set of metric sockets and wrenches (10, 13,15,17,19 mm), a 6 mm Allen socket, a 24 inch breaker bar, a piece of angle iron for holding the crankshaft, a two inch piece of pipe for installing the seal, pry bars, a hammer, vice grip pliers, electric drill and a small bit, center punch and additional tools per specific job requirements. Parts and materials: Timing belt, crankshaft front oil seal, lacquer thinner, rags, grease, oil. Shop labor cost for the job: $400-600. 1) Break the 19 mm lug nuts and jack the car up and remove the right wheel. If the wheel well lower cover was not removed earlier, remove it now. Set a jack under a substantial support beam and raise until high enough to remove the wheel. I set the outer part of the lower control arm down on railroad ties. 2) Unsnap the air cleaner upper cover clamps. Loosen large screw clamp from the outer intake duct. Unbolt two 10mm bolts holding the lower cover to the wheel well. On this car the lower duct does not separate from the lower air cleaner cover. It unsnaps from an assembly further down. 3) Remove the air intake duct from the throttle body (optional, removal is simple and gives more room to work). There is a hose and electrical connector that must be removed. 5) Remove the serpentine belt. With a 15 mm box end wrench on the tensioner, release the tension and pull off the belt. 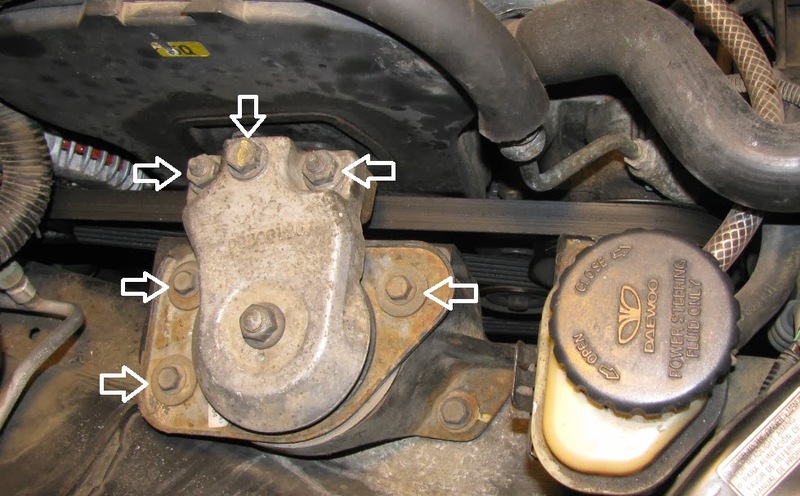 6) The right wheel well engine mount will have to be removed. Put a scissors jack under the oil pan, with a large piece of wood on the jack to distribute the load. Also add another small piece of wood to the front of the setup since the pan is greatly angled back. 7) Unbolt the engine from the mount on the right wheel well. There are three 12 mm bolts on the wheel well side and two 17mm nuts and one long 17mm bolt on the engine side of the mount that must be removed. A little tapping got the bracket loose and removed. 8) Remove the upper timing cover. There are two self storing clamps that must be un-clamped. Then remove a 10 mm bolt holding a small plastic inner cover that fits over the engine mount. Remove the cover by pulling upward. Remove a lower 10 mm bolt just above the oil filter. The cover can now be removed through the top by flexing it and slipping it through the small gap between the brackets. 9) Remove the four 6mm Allen bolts from the crankshaft pulley and pull off the pulley. It will be necessary to hold the crank bolt to remove these. 10) Set the engine at top dead center for cylinder 1. Turn the crankshaft clockwise with a breaker bar and 17mm socket. There is a rectangular depression on the outside of the crank sprocket that will align with a timing mark, a notch, in the lower inside timing cover. When this mark and the two camshaft sprockets are aligned at the same time, that’s top dead center. 11) Remove the timing belt. Loosen the tensioner with a 13mm socket and a ½ ratchet with adapter. Release tension by turning the arm with the hex hole counterclockwise. Lock the cam sprockets in place with vice grip pliers.Remove the timing belt from the top to bottom. Keep all three sprockets aligned throughout this procedure. 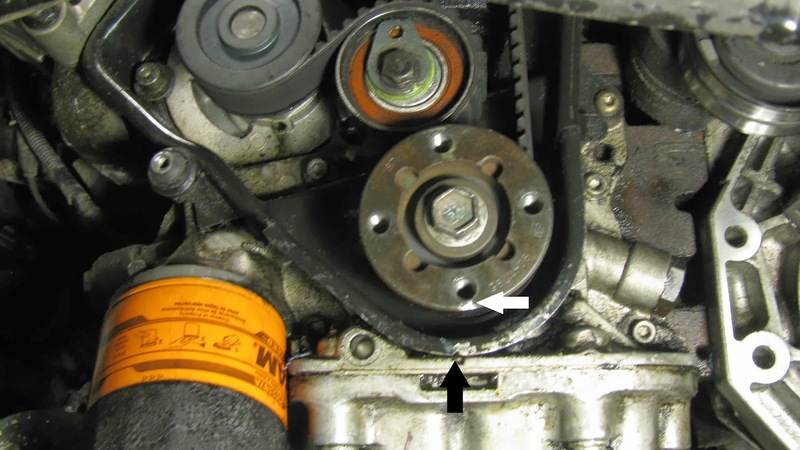 The following steps are for replacement of the crankshaft front seal. Skip to step 20 if only replacing the timing belt. 12) Mount a piece of stout angle iron to two of the holes in the outer face of the crankshaft pulley with two of the existing bolts. The holes in the bar are 4 cm apart. Remove the crank bolt with a 17mm socket and 24 inch breaker bar with the fabricated tool jammed on the spindle, axle or block of support wood. 13) Remove the crank sprocket. This is a one piece part with the flange that has the holes for the pulley drilled in it. It is on there good. I used two pry bars, a small one deep in there under the sprocket and a larger one under the edge where the sprocket portion meets the flange portion. It took a while to work this off. At then end I went to a large “toad sticker” screwdriver and the biggest prybar. 14) There is a bushing behind the key that has to come out. Tap the key with a hammer and screwdriver and it will move up and out. Remove the inner bushing. 15) Remove the crankshaft seal. Use a punch to indent the middle bottom of the seal for drilling. Drill a small hole through the seal. I turned in a small Philips head sheet metal screw and then a larger one . When fully seated, I used a pry tool repeatedly for maybe 5 minutes before the seal gave way. This seal was really in there. The rubber part of the seal had separated from the metal part, causing this big leak. 16) Seat the new seal with a piece of pipe and a big washer and the crankshaft bolt. I had to add the big bushing with the 3.1 cm wide piece of 2 inch diameter PVC to get the seal all the way seated. Make sure to lubricate all contact surfaces with grease. Take care to seat the inner spring loaded portion of the seal to the crankshaft mating surface before driving the seal into place. 17) Clean up everything in the belt path. I used cue tips on the cams and water pump pulleys and cleaned the crankshaft sprocket. Re-install the inner bushing and key back into the key way, tapping it in with a hammer. 18) Install the crank sprocket back on the crankshaft. Cleaned it up a bit first with some sandpaper. It slid right on. 19) Once again using the holding bar, torque the crank bolt to 77 ft lbs. 20) Install the timing belt. Remove the firewall side idler pulley with a 13 mm socket. Start with the belt over the crankshaft sprocket and work up the right (radiator) side, keeping tension around the idler pulley and up and over the two cam sprockets. Then route it down to the right of the post for the removed idler and back around the water pump sprocket, then over the loosened tensioner. While putting all the slack to the right of the idler pulley post push the idler pulley into place with the belt inside and torque to 18 ft lbs. This is a tight fit. 21) Adjust the tensioner. Using the 6mm hex head slot in the adjustment arm of the tensioner, rotate it in a clockwise direction until the pointer above lines up with a notch behind it. It is useful to have a second person for this or you will be up and down a lot to get this right. When properly adjusted torque the tensioner nut to 18 ft lbs. 22) Rotate the engine by using a breaker bar or ratchet on the crank bolt, a minimum of two revolutions and check the timing marks again. If all marks are aligned move to the next step. If not, loosen the tensioner and re-position the belt until every thing lines up, re-tension and try again. 23) Install the large timing cover and torque the two bolts to 8 ft lbs if using a wrench. 24) Install the small timing cover with the 10 mm bolt. 25) Install the crankshaft pulley with the four 6 mm Allen bolts to 20 ft lbs. 26) Install the serpentine belt. 27) Install the engine mount. The larger 17 mm bolts toward the engine should be torqued to 38 ft lbs, the three 12 mm bolts on the wheel well to 25 ft lbs. 28) Remove the jack from under the oil pan. 29) Install the lower air cleaner cover and bolt back on with the two 10 mm bolts. 30) Snap the air cleaner and cover in place. 31) Install the air intake duct to the throttle body and the air cleaner and reconnect all hoses and electrical connections. 33) Install the right wheel and set the vehicle back down. 35) Run the engine and test for leaks. Thanks for having a look at the post and I really appreciate the comment.